Get a few miles in before work or at the end of the day, or even if you come home for lunch, with the Sunny Health & Fitness SF-B1421 Indoor Cycling Bike, a simple and effective way to get in that cardio workout. This versatile, chain-driven bike features micro-adjustable resistance on the 30-pound flywheel, giving you exactly the level of workout that works out best for you. 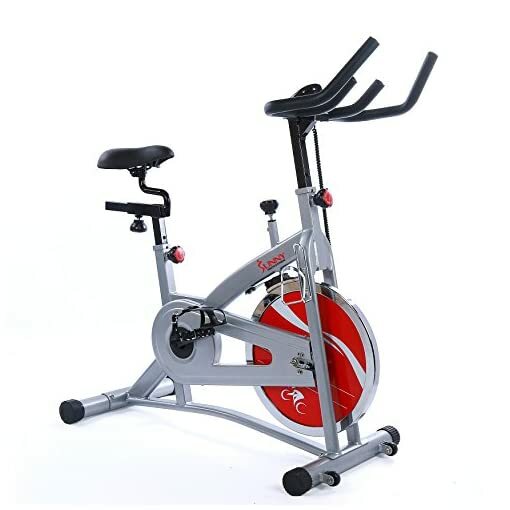 Additional Features: Steel frame with powder-coat finish Cushioned saddle adjusts in 2 directions Displays time, distance, speed, and calories burned Cage-style pedals Bottle holder Transport wheels Weight capacity: 265 lbs. About Sunny Health & Fitness Sunny Health & Fitness has been importing and distributing high-quality health and fitness products for over ten years. From their headquarters in Los Angeles, California, they import equipment from direct sources in Taiwan and China to provide more competitive pricing than the average health and fitness equipment distributor. Because they are committed to excellence and stand behind the quality of every one of their products, Sunny Health & Fitness has become one of the fastest-growing companies in the market. Chain-driven, 30-lb. chrome flywheel. Fully adjustable seat and handlebars. Informative LCD display. Micro-adjustable resistance knob. Press-down braking system. Dimensions: 40L x 20.3W x 49H in..